Oy vey. I didn't realize how involved this Kylie Jenner Sinful Colors collection went. There many sub collections of mattes and other stuff, that honestly I couldn't tell you everything. I don't even know. I *think* Slay Grey is part of the Precious Metals & Crown Jewels part of the collection that is then part of the Sinful Shine Gel Tech line. Are you confused yet? So am I.
I can't say I'm a fan of Kylie Jenner or anything Kardashian/Jenner for that matter. I give kudos to this family for knowing how to rake in the dough, I bought into it buying this color. That's about where the compliments end though. Materialistic stuff, fashion, luxury just isn't my thing. I have 4 pairs of shoes, 2 handbags I rotate between, and I live in jeans and t-shirts. I'm a very simple person. Any other simple jeans and t-shirt people out there? Slay Grey is a soft grey with golden/green glass fleck shimmer. Collection: Sinful Colors Sinful Shine Gel Tech Kylie King Precious Metals & Crown Jewels Collection 2016. Haha, try saying that a few times in a row. Color: I adore Slay Grey, despite the cringey name. This is a soft neutral flattering shade with a gorgeous glass fleck shimmer. I adore this and I will give Kylie or whoever made this for Kylie credit for using a glass fleck shimmer with this. 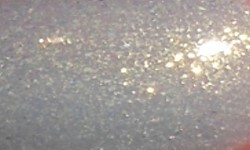 I miss glass fleck shimmers! Formula: Excellent formula. I found this formula very smooth and so easy to apply. I used 2 coats. Price: I believe I paid $2.99 for this at Big Lots, but I've also seen it at Walgreens. Overall: Kylie and her Kardashian/Jenner clan can have all the money and glam, but I'm happy with this pretty nail polish. The color is stunning and I'm all about that glass fleck shimmer. The formula is on point and the price is great. Kylie just might make it as a contender in my Top 25 of 2016 polish list.